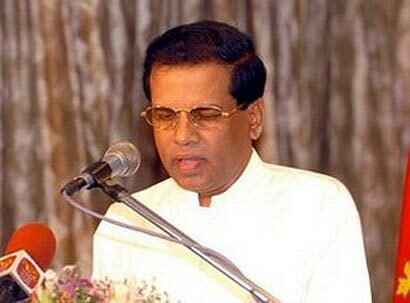 Healthcare Minister Maithripala Sirisena says a large scale financial scam could have taken place at an ongoing building project at a major government hospital. MP Sirisena blames the health ministry bureaucracy for possible irregularities in the building project. Addressing a recent close door meet at the National Blood Centre, an irate Health Minister alleged that a staggering Rs. 300 mn had been spent over an estimated Rs. 400 mn for the construction of a multi-floor building in the Central Province. The minister said that the project launched in 2009 hadn’t been completed, though Rs. 700 was spent so far by the ministry . The SLFP Gen. Secy said that it wasn’t clear how much the project could cost the taxpayer. The minister expressed serious concern over financial discipline in the health sector in spite of having take part in various workshops to enhance accountability and transparency. The minister stressed the importance of thwarting waste, irregularities and corruption in the public sector. The attack on the controversial Peradeniya hospital project comes in the wake of last Saturday’s revelation by The Island of Minister Sirisena seeking Attorney General’s intervention to curb corruption in the public health sector. Minister Sirisena alleged that the Technical Committee, which endorsed the hospital project, was answerable for the situation. Sources told The Island that Minister Sirisena had earned the wrath of some his colleagues and ministry officials over criticism of the health sector irregularities. Sources said that the Polonnaruwa District MP had indicated that he wouldn’t represent the interests of businessmen and their henchmen at the ministry. Responding to a query, sources said that the recently activated Bribery Commission, the Auditor General’s Department and parliamentary watchdog committees, Committee of Public Enterprises (COPE) and Public Accounts Committee (PAC) should investigate health sector corruption. Sources said that they couldn’t ignore the recent statements attributed to Minister Sirisena. The lone crusader against corruption and indeed, the last remaining patriot. Long live Maitripala. May your voice be heard loud and clear.